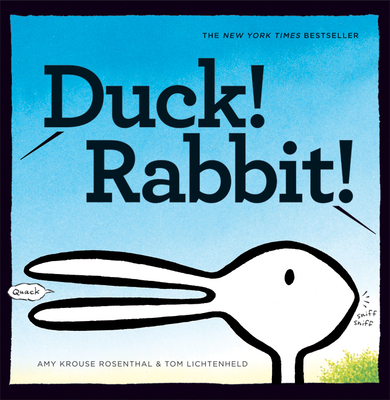 From the award-winning author of Little Pea, Little Hoot, and Little Oink comes a clever take on the age-old optical illusion: is it a duck or a rabbit? Depends on how you look at it! Readers will find more than just Amy Krouse Rosenthal's signature humor herethere's also a subtle lesson for kids who don't know when to let go of an argument. A smart, simple story that will make readers of all ages eager to take a side, Duck! Rabbit! makes it easy to agree on one thingreading it again! Amy Krouse Rosenthal is a Chicago-based writer. She is the author of Little Pea, Little Hoot, Little Oink, and several other books for children and adults. Tom Lichtenheld works as both an advertising art director and as a creator of of children's books. He has written and illustrated several books, including Everything I Know About Pirates. He has also collaborated with Amy Krouse Rosenthal on The OK Book and It's Not Fair! He lives in Geneva, Illinois. A New York Times Bestseller for 9 weeks!